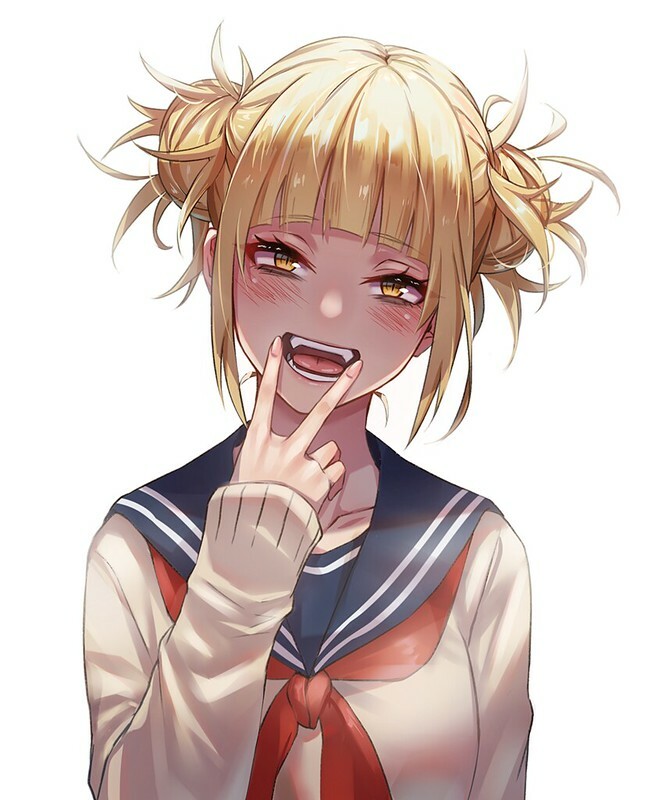 Himiko is a relatively petite, fair-skinned girl, who is very prone to blushing and frequently described as having a rather pretty face. She has slightly inward-tilting eyes, their irises bright yellow and their pupils thin slits, making them somewhat resemble those of a cat, and her mouth is also rather feline, as both her upper and lower canines are more pointed and longer than the rest of her teeth. Her hair is a pale, dirty ash blonde and is styled into two messy buns, numerous wild strands sticking out at all angles from their centers and where they’re fastened, a straight fringe and two chin-length side bangs to frame her face. Her casual outfit consists of a plain seifuku with a Kansai collar, both the skirt and the shirt dark blue with a double white trim, which is paired with a red scarf that she ties loosely below. Over this she wears an over-sized tan cardigan with a rather long hem and cuffs, and pockets on either side, the right one shown to hold a number of trinkets on either a keychain or a cellphone strap. She sports knee-length black socks and dark brown dress shoes with thick heels. Himiko was chosen by Master Invi directly for the Anguis Union. Like the others she also appears to be a bit sneaky and on the outskirts of normal Keyblade society. Upon recruitment she was taught to use Master Form by Master Invi, to help account for her weakness. 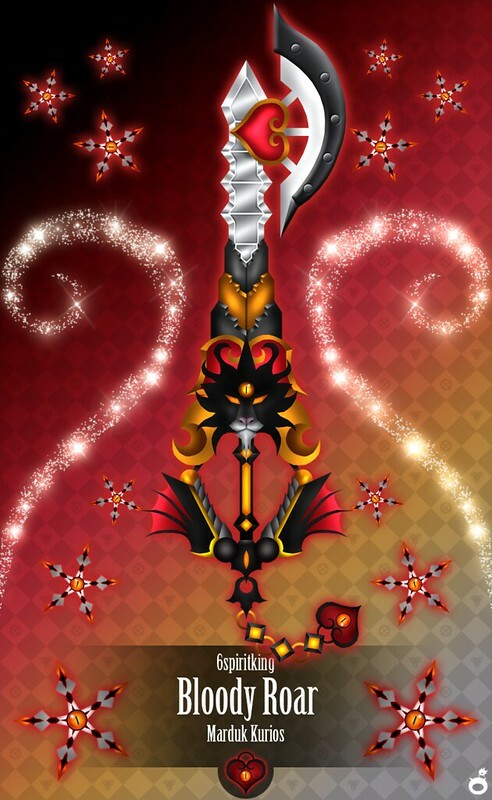 A Keyblade with a large axe and heart shaped emblem at the top. It has a white sword-like shaft being swallowed by a series of beast like mouths. Or perhaps it is more proper to say that the mouths of the starving beasts roar and produce a large blood-thirsty axe in pristine condition. The handle of this weapon is that of something akin to a demonic lion complete with bat wings and golden feline eyes not unlike Himiko's own on its forehead and also marking its Keychain. This includes a large heart shape on the Keychain as well as one beneath the lion head. Blood Mist - When using her Keyblade, Himiko has the ability to create a blood mist in the area but only after certain conditions have been met. Mainly it is after the axe of her weapon has downed enough enemies, something which is gauged by the weapon itself as it fills the heart closest to it. Once it is full, the "Mist" is released from the tip, marring the battlefield before her. This blood mist is exceedingly dangerous because it also uses the power of darkness to blind opponents in a literal manner giving her the freedom to attack or resuce as she sees fit, as she is unaffected by it.